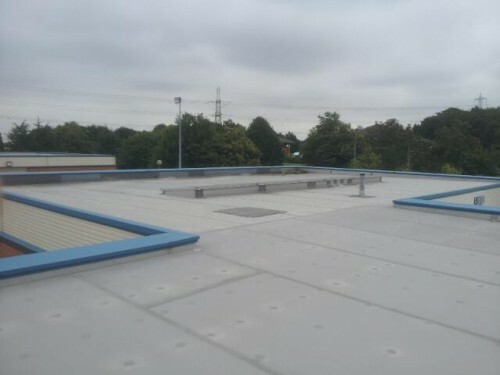 Falcon was contacted by System Devices Ltd in Runcorn, Cheshire, after their local maintenance contractor came across our work in Warrington town centre passed our details over. 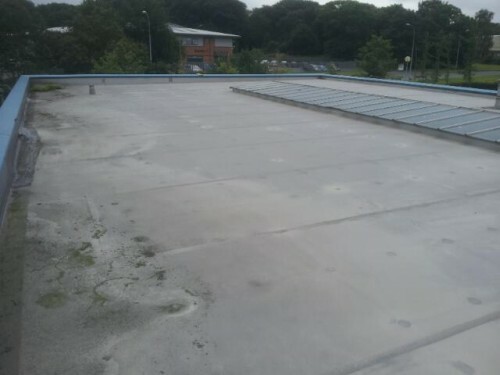 Despite the roof covering being as old the industrial unit at circa 30 years, we were able to confirm the current covering as a Sika Trocal Roofing system, with an 80mm warm-deck insulated build-up, mechanically fixed into a 0.7mm steel roof deck. 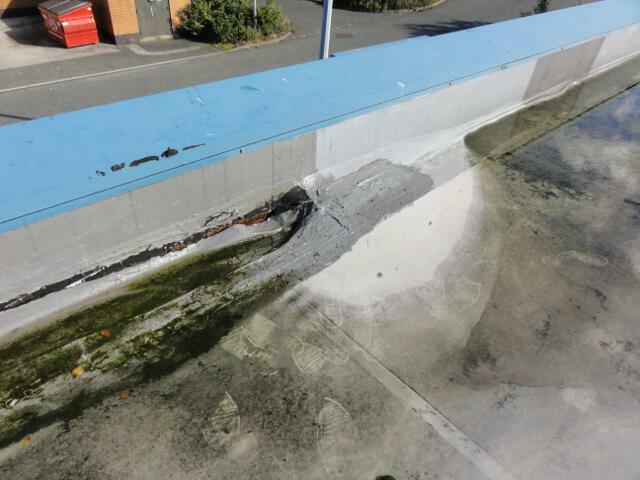 As always, Falcon carried out a flat roof survey, enabling us to understand the reasons for the ultimate failure (albeit after more than 30 years in service) of this particular Sika Trocal membrane roof. A detailed survey report ensured any highlighted problems were addressed, with particular emphasis on any areas where standard Trocal details may have been incorrectly fitted. 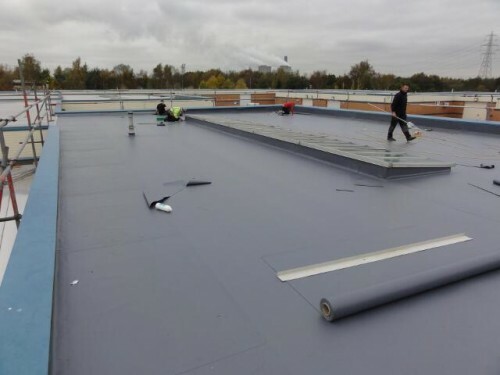 Especially over the long periods of time involved, some degree of shrinkage is to be expected as a characteristic of all single ply roofing systems. Today, the more robust systems (generally not rubber) are engineered with mechanical perimeter restraints securely fastening the roof at its edges and eliminating movement through shrinkage. 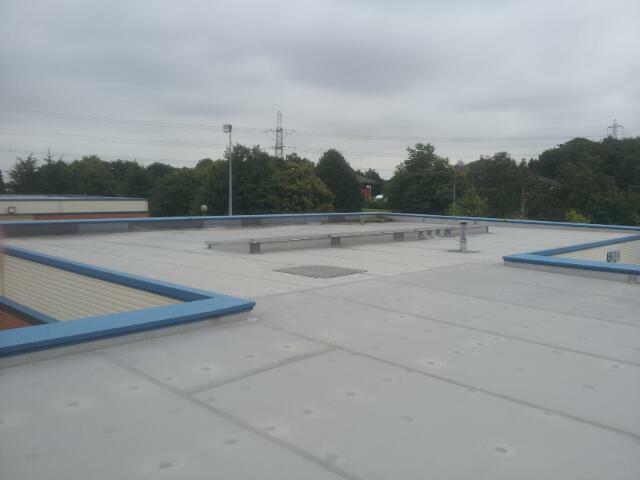 The particular Trocal perimeter detail employed in this case relied upon an adhesive rather than mechanical restraint, which had clearly begun to fail some years ago and was allowing the Trocal single ply membrane field sheet to pull away from the perimeter wall, leading to a large tear along the roof’s edge which was advancing slowly and becoming wider. To make matters worse numerous inadequate Trocal repair attempts had been made using bitumen based repair tapes and ‘flash band’ etc. Trained Trocal roofing contractors would have been aware that PVC Sika Trocal single ply membranes are not compatible with bitumen, and contact between these substances attacks and degrades the Trocal roofing system causing plasticiser migration / plasticiser loss. 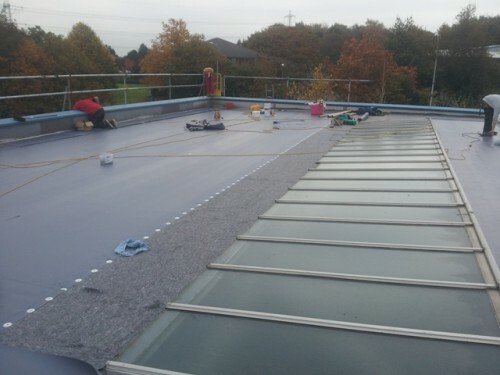 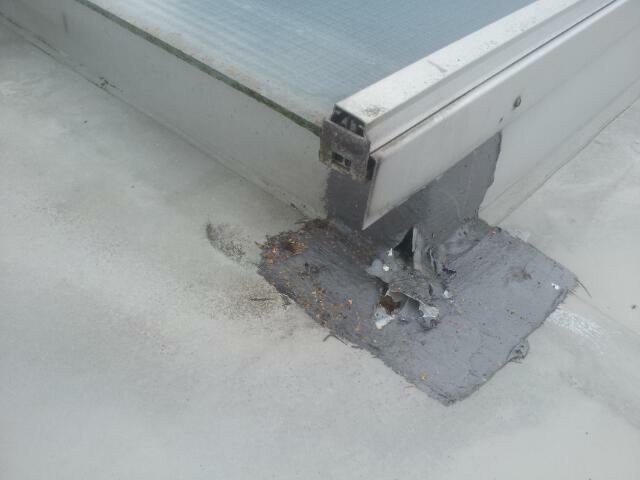 Given the irreversible damage done by the incompatible repair materials, the failed edge detail and the likelihood of this continuing to advance throughout the perimeter of the roof, all were in agreement and the present Sika Trocal Roofing System was deemed to be beyond economical repair. 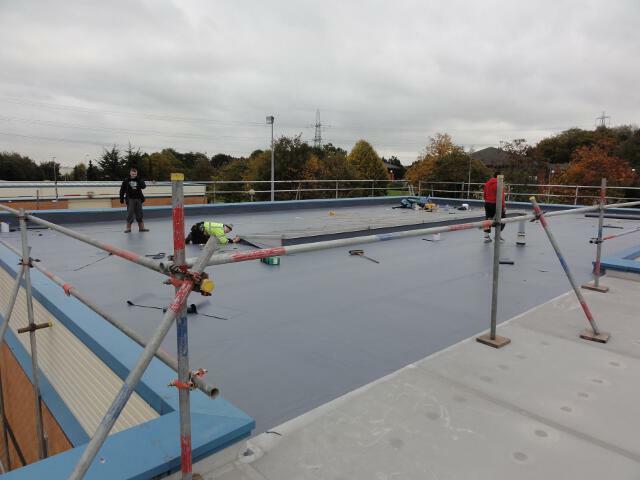 The client invited quotes for a number of replacement flat roofing systems, including liquid applied roof coatings and traditional felt roof coverings. As approved installers of all types of waterproofing systems, Falcon proposed that there was no reason to deviate from the type of roofing system and method of attachment that had proved itself over 30 years or so, especially as this would deliver the most cost effective solution both in terms of speedy, reliable installation and allowing the old system to remain in place. 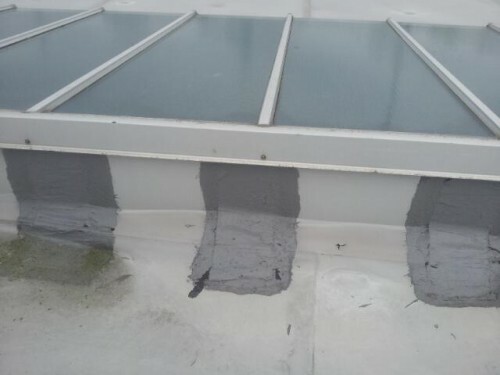 In contrast, the application of a liquid roof coating system would have required separate treatment of the failed perimeter detail to prevent severe separation and ‘tenting’ from continuing to advance throughout the roofing system and provide a stable carrier for the roof coating. 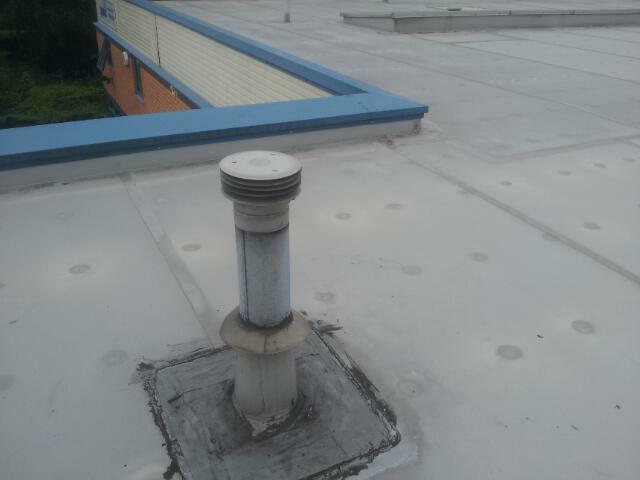 Install Duranite pre-formed rainwater outlets. 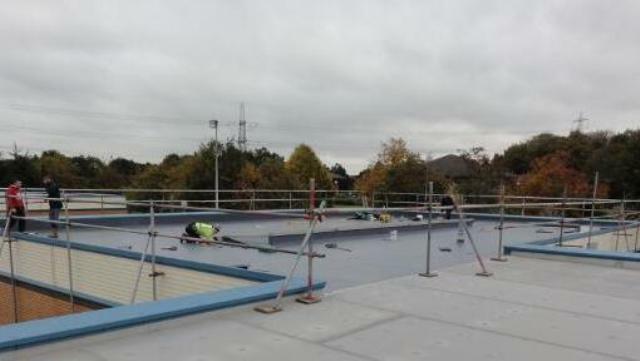 As a leading specialist single ply membrane contractor, all our work is to the highest standard and fully guaranteed. 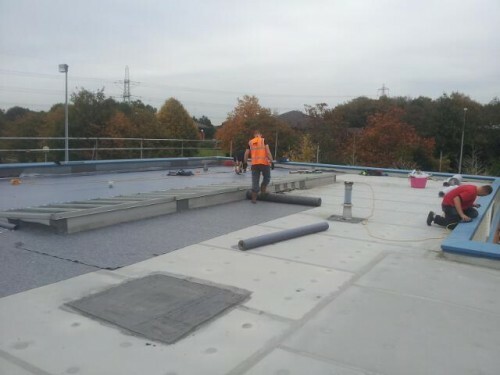 We regularly carry out work ranging from small domestic Trocal roof repairs, through to the re-covering of blocks of flats/apartments, factories, industrial units and all aspects of commercial flat roofing. 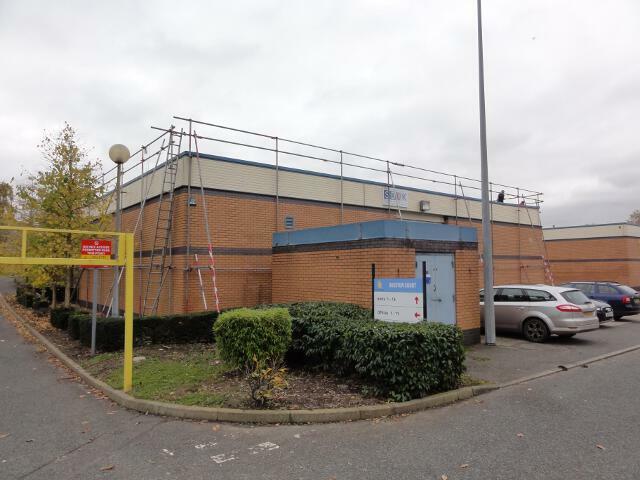 Falcon Roofline work predominantly throughout the North West, and often further afield if we are able to accurately price from a drawing and the job is large enough to absorb travel/accommodation costs.